Norma Soberanes was at a funeral, along with many of her neighbors in the village of Hueyapan, Morelos, 30 miles south of Mexico City, when last Tuesday’s earthquake struck. That afternoon, and for the three previous days, Hueyapan and its surrounding villages, straddling the border that separates the states of Puebla and Morelos, were jammed with traffic. Cars and trucks carrying donations and volunteers threaded the narrow streets, winding past walls marked with the word PELIGRO, or DANGER; signs taped into their windshields announced their provenance – State of Mexico, Hidalgo, Puebla, Guanajuato – a map of solidarity radiating across the republic. Direct Relief’s aid effort on Saturday, made in partnership with the CIDE (Centro de Investigación y Docencia Económicas, or Center for Research and Teaching in Economics), included ten vehicles and more than 30 volunteers who distributed nearly 450 individual hygiene kits to 13 towns and villages in heavily affected areas. Saturday’s efforts represent the first wave of aid that Direct Relief will continue channeling into the region in the coming weeks. Hueyapan, where at least two dozen houses have been condemned, was relatively lucky. Down the hill in San Antonio Alponocan, just over the state line from Morelos into Puebla, some 90 percent of homes were damaged or destroyed. 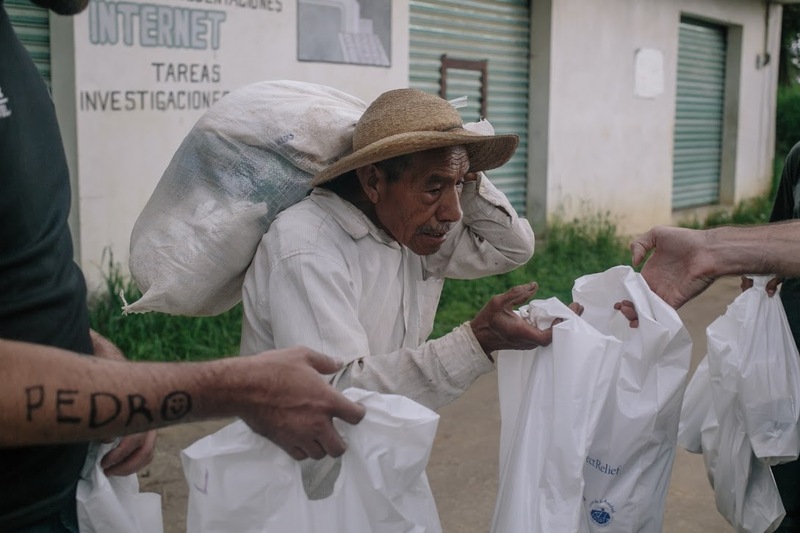 Having gathered a set of Direct Relief aid packages for his family, Vicente Lima Rivera walked back through the intact façade of his six-year-old home. Inside, he stood in an open patio that was once his living room. A makeshift roof of corrugated metal that he and his brother built on Wednesday afternoon covered his furniture, protecting it from the impending rain. According to Lima, a significant portion of the aid that his village has received thus far has come from private citizens, businesses, and organizations like Direct Relief. One little boy said that he’d met volunteers from as far away as Baja California, 1,500 miles to the northeast. One woman had come from the state of Guerrero with a truck full of hot food to distribute among residents and volunteers. Four years ago, she says, floods obliterated her home. Help had come from all sides. “As soon as I heard what had happened, I knew I needed to do something,” she said. Lima says it will cost some 350,000 pesos (nearly $20,000) to rebuild the home he lost. The reconstruction process could take years. Endelia Balderas Perez, whose house in Hueyapan collapsed in the quake, says, “it’s not like we build our houses here in a month. We have to buy materials bit by bit and put them aside, so it can take a year to build just a simple casita.” Lima and his neighbors have been deeply moved by the amount of support they’ve seen thus far, but worry what will happen as the initial enthusiasm from private citizens wanes. Late Saturday night, as the truckloads of volunteers in hard hats pulled out of town singing patriotic songs, Gelacio Sanchez Rojas sat under the broken lintel of his shop on one of Alponocan’s devastated side streets. A trio of engineers from Mexico City, Puebla, and Monterrey (far away in Mexico’s north) had inspected his store and told him it could be repaired.